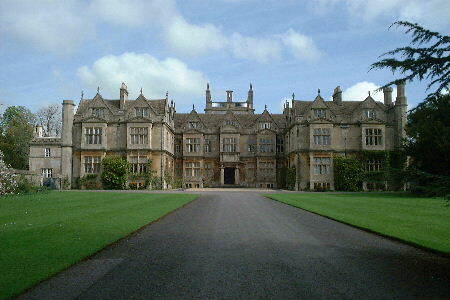 Members and Friends of the Historic Houses Association are admitted to Corsham Court without charge. (Cards must be shown at the cash desk.) Click here to visit the H.H.A. web site. Attractions throughout Wiltshire are promoted by the Local Authority. Click here to visit the Wiltshire Council web site. Corsham Court is pleased to acknowledge that part of the suite of Eighteenth Century seat furniture mentioned in the penultimate paragraph of this page belongs to Bristol's City Museums and Art Galleries. More about Bristol's City museums and galleries is available by clicking here. Smythe's house was completed in 1582 and its construction forms the core of the property today. It was built, typically, on an E-plan having an east-west axis and forming a block 120' x 30'. The drawing above shows how the front elevation appeared up until the alterations instigated on the direction of Paul Methuen following his acquisition in 1745. In 1747 Paul Methuen took up residence in the house, the fee simple of the Manor being conveyed from the Crown to his Trustees by way of an act of Parliament. Methuen considered Elizabethan architecture old fashioned and was an advocate of the Classical theme extolled by architects throughout the greater part of the Eighteenth Century. He soon commissioned Nathaniel Ireson to re-model the North Front and a Palladian design was duly adopted. The works were complete by 1749, when Methuen married Kitty Cobb. Regrettably the severe "contemporary" architecture did not fit comfortably with Smythe's south front of nearly two centuries earlier. Moreover, none of the rooms within the mansion were appropriate for the creation of a picture gallery, essential for the proposed display of Sir Paul Methuen's Picture Collection amassed mainly during the first half of the Eighteenth Century. In 1760, Lancelot "Capability" Brown was invited to Corsham by reason of his reputation as a landscape gardener and architect. Paul Methuen's ambitions ran to the improvement of the gardens and park as well as the extension of his house. At the time, it was not uncommon for garden/landscape planners and architects to rail against each other when contriving a "treatement" for the same property. The comprehensive "Brownian treament" avoided such dilemma and Brown's ideals were widely publicised and appreciated. Brown's remit was to integrate the proposed Picture Gallery with the Elizabethan ground plan, thereby preserving the character of then Elizabethan South Front. His concept followed the principle of doubling the bay windows of the projecting wings (see above photograph of front (south facing) elevation today). The Picture Gallery (designed as a triple cube) and smaller Cabinet Room occupied the full extent of the ground floor of the extended east wing. The Gallery itself measures 72' x 24' and is lit by large windows, on the east side, overlooking the park. The double hung sliding sash windows were perhaps the most prominent feature of this Classical design for the East Front later embellished by Nash (see below). The plain, austere design accorded with Paul Methuen's taste for plain symmetrical architecture and was much in keeping with Ireson's North Front. It had, however, been impossible to accommodate the length of the Picture Gallery whilst preserving the symmetry of Ireson's earlier work. When Paul Methuen died in 1795, part of Sir Paul Methuen's original collection still remained at the family house in Grosvenor Street, London. In his will, Paul Methuen requested that his son and heir, Paul Cobb Methuen, should bring all the remaining pictures, plate, chinaware and books to Corsham. Almost inevitably, there was insufficient space available for the proper display of these treasures and further alterations were conceived. Humphry Repton was known to the Methuens through his advocacy of Brown's work (Brown having died in 1783). It was Repton who introduced John Nash to the family. 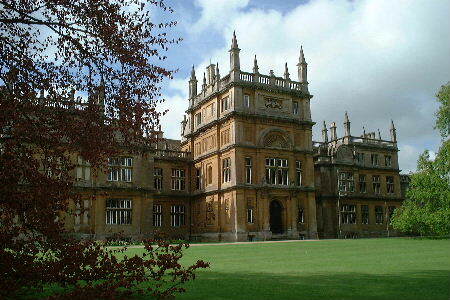 A little known architect with a business in South Wales, Nash had craved aristocratic patronage. 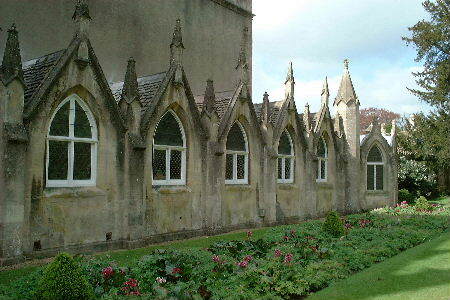 Paul Cobb Methuen had been impressed by Horace Walpole's Strawberry Hill gothic style and directed Nash to adopt similar lines for the reconstruction of the North Front at Corsham. Nash (ably assisted by the draftsmanship of Repton's son John Adey Repton) did not fail to impress with his "fairy tale" gothic designs. These included a central Octagonal Saloon (inspired by Henry VII's Chapel at Westminster Abbey) and a music room which was to be used essentially as a picture gallery. Building work commenced in 1797 although the project was fraught from the outset. The growth of Nash's reputation far outstripped his ability to service commissions competently. He was often unavailable to attend on site when needed. Crucially, at Corsham, it seems he never acknowledged the inadequacy of the Elizabethan foundations to bear the mass of stone, iron and timber specified. His lack of supervision was prejudicial to on-site workmanship and he failed to recognise the fundamental properties of some of the materials deployed in construction. This led to differential expansion and contraction in roof members with consequential rain water penetration. Moreover, Nash's original estimate for the works entailed proved woefully inadequate. He had submitted an estimate, in December 1778, in the sum of �5,647 although, by completion in 1805, the final total billed stood at �25,500. An outbreak of dry rot took hold and in November 1812, and invoices amounting to £800 were received for modifying the roof. The work failed to cure the dampness in Nash's suite of three rooms on the North Front and the dry rot continued to spread. Methuen wrote to Nash complaining of the decay in the Music Room ceiling, and in reply, Nash asserted that the problem was due to the "knavery and neglect of workmen" for which he could not be held responsible. It was this defence that was cited by Nash during the litigation that ensued. Endless correspondence and court papers were passed back and forth and sadly seem to have consumed some important historic documents, including Repton's red book for Corsham. Ultimately cleared from a solicitor's archive (and possibly burnt), these important papers were lost forever. Nash's gothic creation stood for only 40 years after which most of his North Front was demolished. All that remains are the ornate gables of the domestic quarters and attractive dairy (with stained glass windows) pictured here. His work is still in evidence elsewhere though and visitors will note the oriel window and turrets, over the East Front, that were added by Nash. He also "gothicised" the Elizabethan riding school and stables to the south (on either side of the massive entrance piers from Church Square) and further embellished Brown's bath house in the gardens. His legacy includes alterations to furnishings within the Court also. Paul Methuen succeeded his father, to the house and estate, in 1816. Through actively supporting the Reform Bill, he was elevated to the Peerage in 1838. Meanwhile, Nash's building work at Corsham had continued to deteriorate and it is feared that a number of important paintings were irretrievably damaged by reason of the damp. It was therefore in order to preserve that collection of paintings and artefacts, held so dear by his grandfather and father, that Lord Methuen commissioned Thomas Bellamy to re-model the North Front of the house (for the third time in one hundred years) in 1846. Bellamy had, up until that time, never undertaken a contract of such importance. His intentions for the house were sympathetic though and his designs, of the Elizabethan revival style, extremely popular. Bellamy too, however, was often not present when required on site. It is recorded that Mr Brewer (Master Mason) being so despondent in waiting for instructions, copied the old stonework of the heavy cornices for the exterior of the North Front from the detail on the South Front. Costs escalated and a second legal wrangle followed. Despite these shortcomings, Bellamy's work remains intact, his significant tower dominating the North Front. Internally, he is responsible for the layout of the Dining Room and Music Room. The grand staircase and shallow barrel vaulted ceiling over are also his work. Bellamy wrote that he had never sought praise in respect of Corsham but that should it be accorded then he would be proud of it. It is true to say that his design carefully integrates with the rest of the building and the stonework has a permanence and monumental (some might say institutional) appearance lacking in Nash's work. 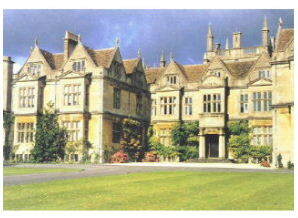 Corsham Court remains in private ownership and is the home of James Methuen-Campbell, the eighth generation of the Methuens to live there. 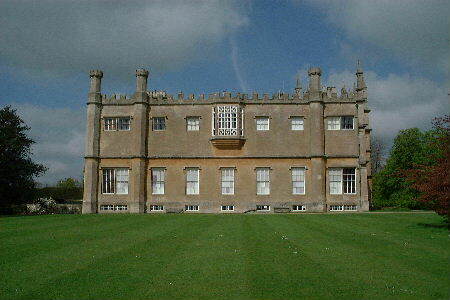 He succeeded to the Corsham Estate on the death of the Sixth Baron Methuen in 1994. Since that time, conditional exemption from Inheritance Tax has been allowed by H.M. Treasury with respect to the library, various paintings and furniture in the private wing of the Court. Special guided tours will be taken of the Breakfast Room and Library enabling visitors to view these collections. Details are posted on the Home Page. Paul Methuen, had furnished the gallery and adjoining staterooms with the very best that money could buy in the latter part of the Eighteenth Century. A set of four pier-glasses and side tables were designed by the Adams brothers for him and he further commissioned a unique suite of seat furniture upholstered in crimson silk damask. These, and other great works, are on display in the Picture Gallery and Cabinet Room, where little has changed since the time of the Napoleonic wars. The Court is used by the Bath Spa University as a post graduate centre and for the study of art, the humanities and cultural industries.